Over the last year or so Resicast has started to broaden its range of British and Commonwealth figures. Firstly they took the path to the first of several individual and sets of early war figures and just recently they have released four LRDG figures. These have been followed up by two new individual figures set in North Africa. 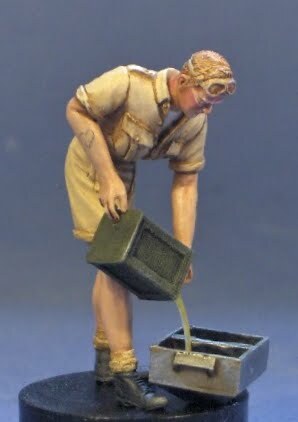 This is a look at the first of these; a soldier pouring petrol from a 4 gal flimsie fuel can and was sculpted by Gerard de Troeye. The figure comes packed in the standard Resicast format being contain in a zip bag within a bag. A paper insert notes the product and manufacturers details and contains an unpainted photo of the built figure. Cast in a light grey resin the figure depicts a soldier bending forward pouring petrol from a can. The figure consists of 7 parts. The body comes as a whole with separate arms and head, a 4 gallon fuel can, handle and a large fuel funnel and handle, typical of those used with the early tanks. The figure is dressed in KD shorts and open neck shirt, with socks folded over the top of the ammo boots. The shorts are turned up at the bottom and the uniform has a nice natural look about it. The head is very nicely detailed with the soldier wearing a pair of goggles on top of his head. The arms are nicely done with rolled up shirt sleeves and are designed to hold the 4 gallon fuel can that comes with the kit. The fuel can looks well done and is marked MT 80 on one side. A very fine resin handle come to attach to the can to complete the build and the can has an indented opening that can be deepened for further effect. To complete the set you get a large fuel funnel which is a welcome additional item. Part 1 is the handle for the funnel which fits across the inside middle of the part. The pose looks very natural and the body proportions are good. Another excellent figure from Gerard for Resicast. This is a nice generic figure lending itself to use in any number of situations with cars, trucks or tanks in North Africa, Italy or even the Far East. If you’re a diorama builder or just a figure painter then you should enjoy this one. The beauty of resin figures are often in their simplicity, with few parts to build you get to the fun part quickly and have great quality detail to work with. The detail and casting are as one would expect, of the highest quality. Very useful figure to bring life to an armor model. Sometimes a simple vignette is enough to show your latest armor model ... no need to go the whole way with a diorama and story. This figure would work well for both.